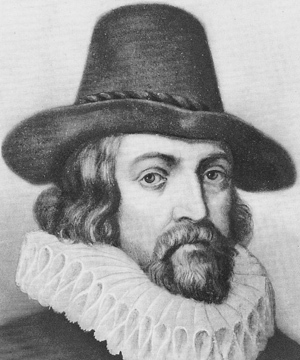 Sir Francis Bacon, 1st Viscount St. Alban, Kt., QC (January 22, 1561 - April 9, 1626) was an English philosopher, statesman, scientist, jurist, orator, essayist, and author. He served both as Attorney General and Lord Chancellor of England. After his death, he remained extremely influential through his works, especially as philosophical advocate and practitioner of the scientific method during the scientific revolution. Be angry, but sin not. Let not the sun go down upon your anger. Anger must be limited and confined, both in race and in time. Certainly fame is like a river, that beareth up things light and swollen, and drowns things weighty and solid. Fortune is like the market, where many times, if you can stay a little, the price will fall. Glorious men are the scorn of wise men, the admiration of fools, the idols of parasites, and the slaves of their own vaunts. Human knowledge and human power meet in one; for where the cause is not known the effect cannot be produced. It is a strange desire, to seek power and to lose liberty. It is not possible to run a course aright when the goal itself has not been rightly placed. It is true that that may hold in these things, which is the general root of superstition; namely, that men observe when things hit, and not when they miss; and commit to memory the one, and forget and pass over the other. Nature is often hidden; sometimes overcome; seldom extinguished. Prosperity doth best discover vice, but adversity doth best discover virtue. Silence is the virtue of a fool. The human understanding is of its own nature prone to suppose the existence of more order and regularity in the world than it finds. The joys of parents are secret; and so are their griefs and fears. They cannot utter the one; nor they will not utter the other. Truth will sooner come out from error than from confusion. Virtue is like a rich stone- best plain set.